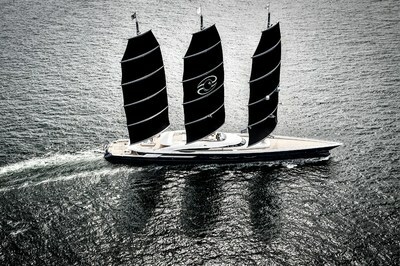 The 106.7-meter (350-ft) three-masted Black Pearl, built by Oceanco, is the largest sailing yacht in the world. She is a unique and complex vessel that represents the intricate and successful collaboration on the part of an international group of designers, engineers, naval architects, builders, and project managers. The owner drove us to new heights, says Marcel Onkenhout, CEO of Oceanco. It was an absolute pleasure to work with an owner who was so passionate and dedicated even to the smallest details of the build. The owner of Black Pearl, who has an engineering background, was exceptionally involved in the entire build process. No detail escaped him and he offered invaluable input throughout. Being an engineer, I have a natural inclination and curiosity about new systems and innovative technology. says the owner. Eco consciousness is vital for the future of our planet. I wholeheartedly support research that will drive us to more sustainability and I have ensured that green technology was very much a part of the creation of Black Pearl. The rig of the Black Pearl is prepared for solar sails to be fitted in the future. The development of solar sails is ongoing, but when they become available they can be fitted onboard, delivering— in addition to the driving force — a large amount of electrical power generated from solar radiation. Ken Freivokh of Ken Freivokh Design, who was deeply involved in the design of the Maltese Falcon, was responsible for the design of Black Pearl from its early beginning. The essential consideration was to design a yacht using easily controlled sails as the primary means of propulsion. The Dynarig is a distinctive part and indeed the very raison d’etre of Black Pearl and, as such, plays an essential part in the determination of the spaces, both external and internal. The integration of the rig’s structure required freestanding masts, which was a vital part of the design, ensuring a total symbiosis between interior and exterior spaces. The challenge was to achieve volume and handsome headroom whilst still retaining a sleek and well-proportioned yacht. To this effect, we developed a high ‘waistline’, effectively bringing the apparent hull up to the upper deck for a significant part of the yacht’s length. The result is continuity of line and long sightlines. says Freivokh. Nuvolari Lenard was brought into the project to finesse the layout and take care of the final exterior styling. We wanted to ensure that this very large vessel maintained her appearance as a graceful sailing yacht rather than looking like a ship, which can often happen on vessels that are so large. says Carlo Nuvolari. Dan Lenard says, we believe that good styling is achieved when your eyes are pleased by looking at the yacht from every angle and when all the styling details and the uniqueness of the yacht’s shapes are recognizable at first glance and even from far away, through the unmistakable lines, typical of our style and design philosophy. The yacht’s interior’s centrepiece is a multi-level central atrium, including a magnificent stairwell and lift that rises alongside the central mast. This space contributes to a feeling of vertical integration between the decks. Rather than the conventional array of salons at various levels, there is a central, handsome, high ceiling saloon, with a more informal upper deck saloon/cinema. In addition, a full- beam dining room can convert to a banquet space, utilizing panoramic balconies on either side. Similarly, a large beach club can deploy landing platforms on either side for full enjoyment of the sea. Valentina Zannier of Nuvolari Lenard and French architect and designer Gerard Villate, teamed up with the owner to design the yacht’s interior, which is inspired by classical architecture and interspersed with contemporary elements, magisterially executed by the builder. Rich materials such as crystal, mahogany, Elm burr, and ebony inlays, gilded bronze, marble, onyx, and silk were liberally used in the décor. The Dynarig, despite its size is very manageable; it can be fully operated by just one person. The sail area is subdivided into smaller lesser-loaded sails and they can be set or furled by pushing a button. Astonishingly, all 2900 square meter of sails can be set in 6 minutes! The biggest challenges were to achieve a proper sailing balance and to figure out a system to increase the tacking performance, says Thys Nikkels, Managing Director, Dykstra Naval Architects, the company responsible for Black Pearl’s naval architecture, DynaRig optimization, and sail plan. We achieved this by a faster rig rotation and by designing a very responsive rudder. the waste heat recovery system allowing further gains in overall energy efficiency. One of the owner’s goals with Black Pearl was to try and reduce the yacht’s overall environmental impact and he has succeeded. During sea trials, under sail power at 14 knots the yacht regenerated enough energy to power the full house load. Thus obviating the need to run generators while under sail! The dedicated owner’s team embraced the vision to take new technologies and adapt them to the yacht industry. They collaborated with numerous technology suppliers for solar, hydrogen, regeneration systems, insulation and more. system at the base of the mast. The yacht sails better than predicted. She tacks very well with little reduction in speed and overall performs superbly under sail. Oceanco, a leading builder of custom large motoryachts since 1987, has delivered a diverse fleet of world-renowned yachts. With the delivery of S/Y Black Pearl Oceanco has reinforced its position as a company that can adapt its skillset to any owner’s needs.